A soft and airy style is the perfect finishing touch to any carefree wedding day, and this boho wedding dress from Stella York is no exception! 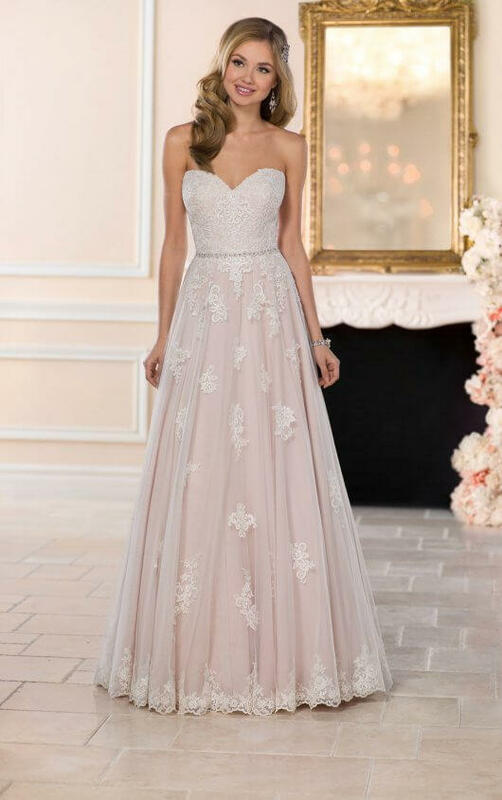 With its figure-flattering, A-line silhouette, this lace and tulle over matte-side lustre satin gown highlights your waist with its detachable, beaded belt and frames your face with its romantic, sweetheart neckline. The bold, lace detailing of the gown carries softly onto the light-as-air skirt, creating a sweet pattern. The hem of this boho wedding dress features a soft, lace scallop that completes the look beautifully. This gown has the option of a lace-up back or zip up beneath fabric buttons and is available in plus sizes.